Sensational: Ireland rocketed to West Indies' first innings score. Saxton Oval, Nelson, New Zealand. 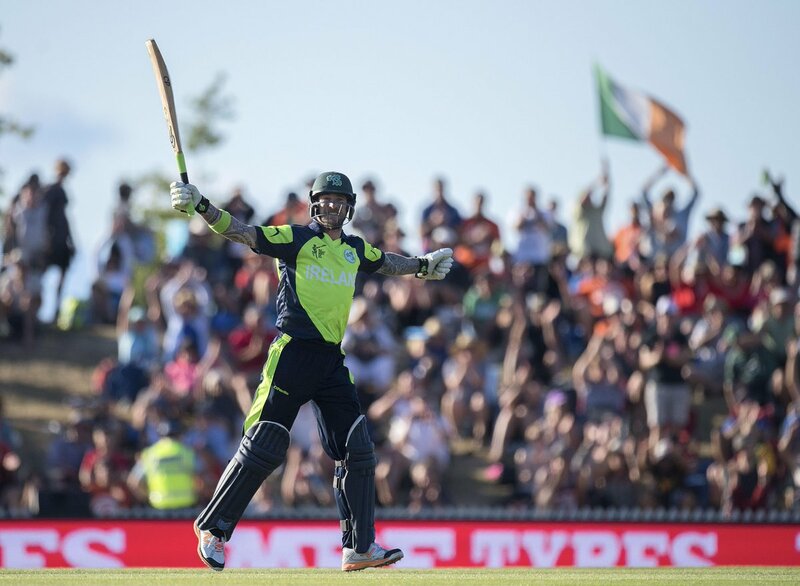 Ireland produced another memorable moment in their cricketing history as they toppled West Indies by four wickets at the Saxton Oval in New Zealand. Ireland won the toss and elected to bowl under a blue sky but also big white clouds hovering over the wicket. The Windies made a fairly decent start to their World Cup campaign as both Smith and Gayle shared early boundaries at the Irish's expense. However, it was being suggested that Gayle preserved a bit of energy to hurt Ireland later on in the match. 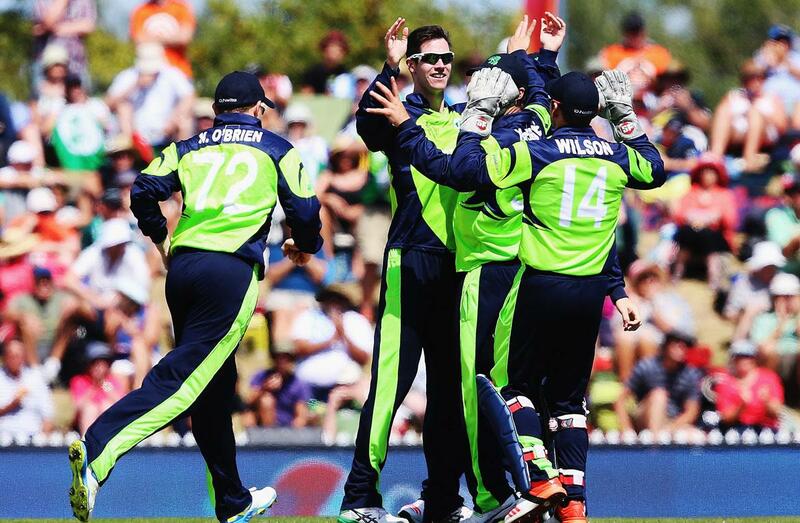 Ireland picked up their first wicket in the 7th over to West Indies' frustration. Smith battered O'Brien's initial delivery up and over towards mid-on but stupidly picked out Mooney who hardly even required positioning to take the catch. Simple wicket for Ireland, it was a great moment splitting the opening partnership that could have transcended into expensive overs for them. Not even a single over after Smith was hideously dismissed, things became worse for West Indies who yet again conceded a wicket that could have been so easy to avoid. Gayle knocked the ball towards point but the unexpectedness and hesitance of Bravo to make the run provoked a rapid response from McBrine who launched it at the stumps and cheaply sent the West Indies man packing who was nowhere close to making the white line. Two quick wickets for Ireland was terrific - but they had a silly shot firstly and total confusion secondly to assist them of that. West Indies responded well that over as big hitter Gayle thumped two McBrien deliveries for four. It became clear that it was vital for the Windies to keep Gayle at the crease considering he's one of, if not their best player. The Irish's third wicket came at the expense of Gayle who lofted towards cow corner but he was unable to lift the ball over O'Brien who positioned himself for the all important catch and took it emphatically. Brilliant take to dismiss a man who had just been threatening to really take off. Vital wicket, and with Gayle gone Ireland could turn their attention to the weaker middle order. The Windies plunged into deep trouble in the 21st over as spinner Dockrell trapped Samuels for lbw. The umpire took a few seconds to reflect on what he saw but eventually dismissed the West Indies batsman. Samuels knew he had a slight chance of overturning the decision because of its direction and reviewed it but that extended proof that the ball was indeed clipping his leg stump. 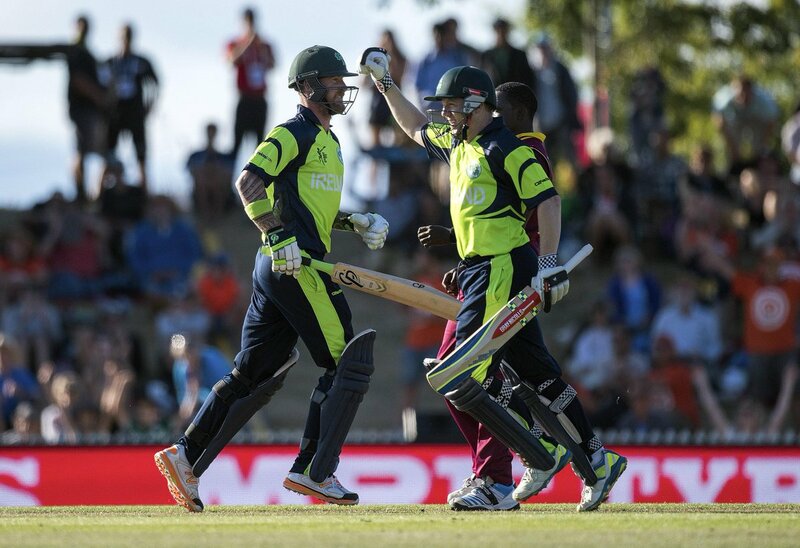 Ireland were rocking at this point as the Windies stalled at a poor 78-4. West Indies, with fresh batsmen Simmons and Ramdin in the crease were unable to really take control of the game and Ireland's decision to bowl first paid off in a big way. Just short of 25 overs with already 4 wickets in the bag was a huge moment in the game because not only did they restrict a bewildered Windies side but the best batsmen had been dismissed relatively easily which said a lot about the state of the wicket. Ireland really began to take full control of proceedings when Ramdin was sent packing not long after entering the crease. The West Indies man attempted a sweep from Dockrell's tricky delivery but completely missed as the ball struck his pad with calls for lbw raucously alerting the umpire who didn't hesitate in dismissing Ramdin who was ineligible to review. After five early dismissals a solid partnership was required and Simmons, Sammy provided that. Ireland were in control before the 30 over mark but West Indies clawed their way back into proceedings courtesy of their calm, controlled mentality and pure class dealing with the spin bowlers. At 40 overs the run rate was a steady one and things were looking better at least for West Indies who weren't exactly scoring rapidly but Sammy and Simmons' brilliant partnership bolstered their hopes of setting Ireland a decent target. With a terrific 119 partnership looking solid and durable, Sammy displayed his superb skills on the bat as he battered Stirling for an emphatic boundary; thus steadily but surely increasing West Indies' score. The Windies really began to take control in the final 10 overs of their innings, with Sammy and Simmons ensuring the Irish would concede expensive runs in each set of six deliveries. However, former captain Sammy survived a scare as his lofted shot initially heading for a boundary was almost caught by Sorenson in the deep but the fast bowler only managed to tip it over the rope for a whopping six. In the very next delivery, Ireland made a massive breakthrough as dangerous hitter Sammy was finally dismissed. With five overs to go - the Windies had absolutely nothing to lose and they went all out attack on Ireland in the death but Sammy frustratingly lashed his shot over to Dockrell at mid-wicket for his marching orders off Mooney's bowling. That all-important wicket broke a marvellous partnership of 154. A second ODI century from the fantastic Simmons was sealed with a boundary as the West Indies man took control over the Irish bowlers; with Simmons lashing his ton in just 83 balls. The Windies eventually managed to knock a solid 304-7 courtesy of the sensational batting partnership from Simmons and Sammy just as they looked out of proceedings. Ireland had a tough job ahead. The Irish made a solid start to their innings as Porterfield and Stirling both chipped in to advance their score to 31-0 after four overs. Stirling banged Ireland's first boundary of the innings in the previous set of six balls. West Indies' first real chance of their bowling session fell at the expense of Porterfield who unintentionally cut back but Russell's right hand spilled the ball at the final hurdle. Should have been a wicket. However, in the 14th over West Indies picked up a wicket with Porterfield sent packing. Gayle's enticing delivery provoked a wild swing from the Irishman and he would slice to Ramdin behind his stumps. It took Ireland just under 20 overs to reach the 100 mark with a content attitude to just simply knock singles off Sammy's bowling at a run rate of 5.30. However, yet another sloppy piece of fielding let Ireland off the hook as Bravo was unable to dismiss Joyce after Gayle's short delivery provoked a massive hook towards fine leg. The Irish were at 171-1 at 27 overs at this point. In the next over, however, West Indies dismissed their second batsman and it was the magnificent Stirling who found himself walking into the pavilion. Just 8 runs away from what would have been a remarkable ton, the Irishman was caught by Ramdin after he sloppily edged to the Windies keeper off Samuels' bowling. Ireland began to steamroll their way to West Indies' 305 target. In the 37th over Porterfield's men introduced the batting powerplay as Joyce and O'Brien continued their marvellous partnership. West Indies were behind and they knew it, but perhaps nervous jitters from an Irish side earned them a wicket as Balbirnie was sent packing. Taylor delivered a short delivery that was there to lash for six runs but the Irishman failed to lift it over Bravo at deep mid-wicket and the West Indies man dismissed Balbirnie. More tension began to grow in Ireland's pavilion as yet another batsman was caught out. Wilson, looking to wrap up proceedings carelessly lashed Taylor's delivery to Gayle clearly stood at cover. However, things took a turn for the worst in the very next over as Smith dismissed O'Brien via run out. Niall initially called for a second run but the hesitance of O'Brien sparked attention and Smith's accurate throw clattered the stumps and sent yet another Irish man packing with only 15 runs needed for victory. That was the last of any Windies celebration as Mooney soon struck the winning runs to a raucous response from Irish fans in attendance. What a moment for them - they comfortably dispatched a capable side in West Indies by four wickets and could have been more if it wasn't for the silly couple of wickets conceded at the death. Absolutely marvellous performance from Ireland - they reduced West Indies to five wickets early on and if it wasn't for the terrific partnership built by Simmons and Samuels this could have been an utter whitewash. Unlike a lot of Ireland victories, this was't just a one man stand out performance like O'Brien's against England a few years ago. Almost every player stepped in and contributed to this memorable victory with the brilliant leadership of Porterfield, Stirling's excellent showing, Dockrell's amazing first innings bowling performance and the whole team spirit and ambition to succeed got them through here. As for the West Indies, maybe if they rallied on a lot quicker early on and built solid partnerships instead of leaving it to star batsmen Simmons and Samuels they could have set a really high score for the Irish. Nothing should be taken away from this resilient Ireland side, though, who have now sent out a big statement to the top dogs in the tournament. Comment: India vs. Pakistan's value eroded? Comment: England World Cup in dire straits?